MarketGrabber is used internationally by a diverse mixture of large, medium and small organizations and web developers providing niche online directories for industry or geographic specific markets. One-time fee for full source license. Hosting and design service optional. 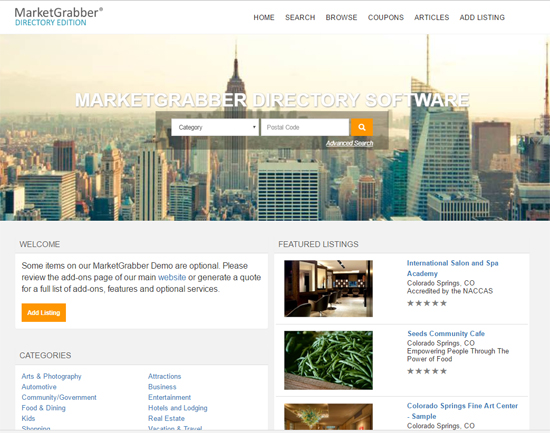 MarketGrabber is the ideal software solution for creating online niche business directories and city directories. MarketGrabber gives you the ability to sell any combination of listings, featured listings and display advertising with unlimited pricing plans. Monetize your site with Google Adsense or similar affiliate programs. MarketGrabber includes a full source licence with the ability to customize to your individual requirements. Hosting, design and customization services available. Cons: I don't have any cons about the software! Overall: Excellent Everything! I have been a very satisfied customer with the MarketGrabber Software and customer service. I have been a customer for over 5+ years with multiple purchases of the directory, classifieds, events, job board, and multi-edition software packages. I have been very impressed with the multi-screen (desktop, laptop, smart device, and tablet) display of the site on these various screen displays. The admin panel is very easy to navigate to modify categories. Also, I like the ability to sell any combination of listings, featured listings and display advertising with unlimited pricing plans. I am also a big of you can monetize your site with Google Adsense or similar affiliate programs. I can not say enough great things about the software and the customer service. The description of the features is right on. This is a very simple, but the robust software package that can get you up and go with directory, idea, or passion. Recommendations to other buyers: Just read through all the features on their site. Thank you so much for the wonderful review Pete! Our team works hard to keep our customers happy and we all appreciate the positive feedback. Best wishes for continued success in your business ventures! Overall: I wish there were more stars to give MarketGrabber because 5 is simply not enough. MarketGrabber's platform is the most efficiently complete directory software in the market.! Trust me, I have been evaluating software for 2 years. Every platform I tried would get me to a certain point and fall short everywhere else. From being chock full of glitches to simply not being able to do what I needed it to do, and/or being so complicated a rocket scientist would be stumped. I was fed up and needed a platform that worked correctly, made sense, and was easy to navigate on the public and admin sides with great user features and a beautiful interface to boot. Is all that even possible you ask? You bet with MarketGrabber! I couldn't believe after 2 years' of pulling my hair out I finally stumbled on the best directory software ever created, and (drumroll please) the customer service is STELLAR! I always feel that help is accessible and that I'm not alone in my business venture. You can be successful with MarketGrabber. So if you're like me evaluating platform after platform, do yourself a favor. Drop what you're doing and get on the MarketGrabber train, because they'll actually get you where you're trying to go! Recommendations to other buyers: Yes, skip the others and go straight to MarketGrabber. You'll save yourself a lot of time and frustration. Thanks so much for the kind words Jennifer, we're thrilled the software is working out so well for you! It's our pleasure to work with you and the whole team appreciates your positive feedback! If you ever need anything we are just a phone call away. Pros: Easy to use and very nice layout. Overall: I own three Market Grabber Products and if I had time I would do 4. Very easy to use and set up. I had been with others but very happy with Market Grabber and no reason to look for other solutions. Recommendations to other buyers: Easy for visitors to create and manage their accounts and any posts they make. Thank you so much for the wonderful review Tim! It has been a pleasure working with you over the years! The whole team appreciates the positive feedback. Best wishes for continued success with MarketGrabber! White Label Directories Done Right! Pros: Ease of use and outstanding support. Cons: First of all we really love it and have no dislikes. I suppose a nice to have would be the ability to add additional pages to the web site in an ad-hoc fashion, although I'm sure that would really challenge the established templates that work so well now. Overall: Market Grabber provides a nice variety of white label applications to meet your needs. It is customize-able and the support team is prompt, intelligent and a pleasure to deal with. Best of all it is a well established application that doesn't bring any bugs or developmental delays that can frustrate entrepreneurs who just want to get up and running. Market Grabber is our trusted solution that we can confidently use to grow our business. Recommendations to other buyers: If you are looking for a reliable resource for a white label directory and you are not interested in building something from scratch, this is the company to call. We learned that using independent developers, resources from India or building it ourselves all come with a lot of challenges and delays. This solution just works. Thank you so much for the great review John! The whole team appreciates the positive feedback and we are here if you ever need anything. Wishing you all the best in your new business venture! Comments: MarketGrabber is a terrific company to work with. It is Fabulous software, very easy to use and the customer service is outstanding. Thank you so much for the positive review Linda! We wish you all the best in your new business venture and please let us know if we can be of any assistance moving forward!